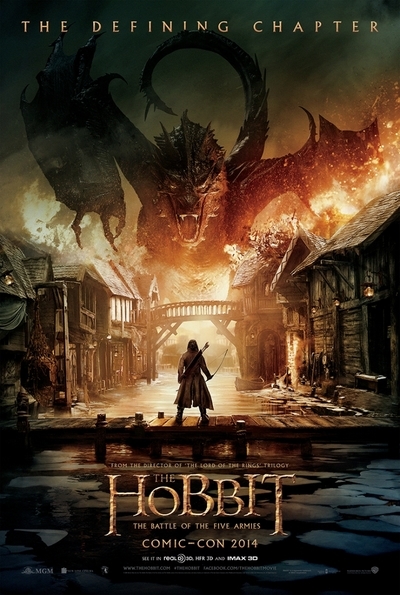 Have you seen The Hobbit: The Battle of Five Armies trailer? The final (and "main") trailer for the final chapter in The Hobbit/The Lord of the Rings movie series is here. Judging by the trailer do you think it will live up to the high expectations set up by the previous five films? I never saw any of them, they just seemed very dark, scary and something mainly something only young people would go to see. The story also made me think I would come out depressed. I know a great deal of people loved them. When I saw the character in the pic I have left and heard him talk for the first time, I remember feeling just absolute Fear. I think it will be a great film, but I can't help but feel, an unnecessary one. A lot of the material used it not from the book, but from appendices. I just saw the trailer a few days ago, and I think it looks incredible. So far I've only seen the first Hobbit film, but this was on purpose. I want to binge watch the three films all at once. How do you feel about Quentin Tarantino's retirement? Star Wars Episode VII: The Force Awakens. What do you think of the title? Do you think Toy Story has dated? What are your thoughts on Interstellar? Are you looking forward to the Harry Potter prequel films? Are you looking forward to Game of Throne series 5? Do you think that the following statement is true: sequels can never surpass the original? The Beatles or The Rolling Stones? Do you attend dog shows?